Welcome to my Week 6 NFL pick’em and previews. Last week I went 8-7, placing my overall record at 45-31-2, ahead of 7 of ESPN’s 10 experts, and 3 of CBS Sports’ 8 experts. Some of the offense-heavy teams in the league take each other on this week. The Chiefs face off with the Patriots. The Raiders take on the Seahawks in London. The Chargers will head to Cleveland to play the Browns. The Bucs and Falcons will play each other in an intriguing divisional match-up. Who will win in these likely shootouts? Read below to find out what I think. With WR Randall Cobb likely back, expect this Packers passing offense to perform a lot better than they did in Detroit, especially since they are home this week. But it’s the run game that I see leading the Pack. These running backs haven’t really had the chance to truly shine in Green Bay’s pass-first offense, but I could see it happening against an inexperienced 49ers run defense. Without QB Jimmy Garoppolo, it will be extremely difficult for the Niners to match Green Bay’s offensive performance. I see the Packers winning easily. This Broncos defense will make it difficult for the Rams to score as much as they usually do, but I think they manage to score 20+ points on Denver, led by RB Todd Gurley. However, I expect Denver’s receivers to have a strong day as well, despite the fact that they are facing a stacked Rams secondary. They have two dependable veterans in Demaryius Thomas and Emmanuel Sanders, and a promising rookie, Courtland Sutton. I think they can handle the Rams secondary, especially with ex-Bronco Aqib Talib on IR. Look for Denver to pull the upset in a game that’s surprisingly high scoring. Expect the Eagles run game to struggle with RB Jay Ajayi on IR. But I think QB Carson Wentz and his receivers will find a way to win it in New York. The Giants offense will struggle once again without TE Evan Engram, but I think WRs Odell Beckham Jr. and Sterling Shepard will have strong games to make this close. Expect Houston’s elite defense to shut down QB Josh Allen and his receivers. I think they will hold the Bills to 1 TD or less in this game. Meanwhile, QB Deshaun Watson and the Texans offense will have a decent enough despite the banged-up run game and lack of WR depth. I see the trio of Watson, RB Lamar Miller and WR DeAndre Hopkins leading them to victory. The Colts offense should look better than they did in New England. Expect RB Nyheim Hines to step it up with the receivers banged up. However, I see the Colts D, which has struggled all season falling apart against a promising Jets passing game. Look for both QB Sam Darnold and RB Isaiah Crowell to have big games as the Jets score at least 4 TDs. New York should win easily with the Colts defense regressively struggling. UPDATE: Ryan Tannehill is OUT, Brock Osweiler will start Look for the Dolphins young D to have success against QB Mitch Trubisky and his offense. Their promising group of receivers will not be enough here as the run game struggles. I also think that with the home-field advantage, the Dolphins will manage to score 30+ points despite facing Khalil Mack and the Bears D. With QB Ryan Tannehill out, QB Brock Osweiler will rely on his receivers as Mack and the Bears front seven shuts down the Dolphins run game. In the end, I have the Dolphins pulling a surprising upset at home, thanks to an all-around elite performance. Look for Cincy’s receivers to step it up against a struggling Steelers secondary. But the Steelers will make this a close shootout. QB Ben Roethlisberger and his receivers will thrive as well against a rebuilding Bengals secondary. But without RB Le’Veon Bell, the Steelers run game will be easily shut down. The Bengals will manage to win thanks to the strong run defense and strong game by their receivers. Look for QB Baker Mayfield and the Browns to make this close in Cleveland. But this Chargers offense has dominated and led the team to victory against every below average defense they’ve played. Look for QB Philip Rivers, RB Melvin Gordon, WR Keenan Allen and company to do the same in Cleveland as they take on an inexperienced Browns D. This stellar offensive performance will lead LA to victory for the fourth time this season. Expect a shootout in this London game. Both these defenses have struggled regressively all season. Look for Oakland’s offense to dominate against the young Seattle D, and expect QB Russell Wilson and his receivers to have a field day against the Khalil Mack-less Raiders defense. I think the Raiders, who will have more success running the ball, will outscore the Seahawks to win it. Expect the Panthers offense to be back at full speed with TE Greg Olsen back. They will be able to take advantage of a below average Redskins secondary with QB Cam Newton’s favorite target healthy. QB Alex Smith and his receivers will put up a fight with a 3 TD game of their own. But look for the Panthers strong front seven to be successful in pressuring Smith and shutting down Washington’s RBs, allowing Carolina to hold on for a victory. I think Arizona’s D will step it up this weekend, allowing them to come close in Minnesota. But the Vikings WR duo of Adam Thielen and Stefon Diggs is just too much for this Cardinals secondary to handle, and their success will lead to an overtime Vikings win, despite the run game’s continuing struggles. The Vikings defense will also have a nice game, holding the Cardinals to just 1 TD and overwhelming rookie QB Josh Rosen. With RB Devonta Freeman out, both defenses struggling, and both offenses dominating, expect a lot of passing in this game. QB Matt Ryan and his receivers should have a field day against the weakening Bucs secondary, while Tampa’s underrated front seven shuts down RB Tevin Coleman. Meanwhile, QB Jameis Winston and his receivers will prove that the Bucs can succeed on offense without QB Ryan Fitzpatrick. Expect them to pull the upset in a shootout, as Atlanta begins to lose hope after another embarrassingly bad defensive game. This Titans roster is filled with young talent on both sides of the ball. Look for their younger players to step it up and lead Tennessee to victory at home. The Ravens should continue their strong season by getting out to an early lead thanks to shut down defense. But Tennessee’s young core will lead to a comeback as they outplay Baltimore. After two straight losses, the Ravens will begin to regress. Expect QB Dak Prescott and his receivers to be shut down by a top notch Jags defense. Prescott looked pretty bad against the Texans D. I can’t see him doing any better against Sacksonville. Meanwhile, the Jaguars will manage to get by on offense, bouncing back from last week’s putrid offensive performance. The combination of these two things will lead to a Jaguars victory, despite run game struggles without RB Leonard Fournette. Check back closer to gametime for a video preview! Look for QB Tom Brady and his receivers to thrive, overwhelming the Chiefs secondary without S Eric Berry. Kansas City’s offense should make this close, but expect the Chiefs defense to blow it despite a 30-point, multi-TD game for QB Patrick Mahomes II and his offense. That’s all for my picks this week. Feel free to comment with your thoughts, and stay tuned for more posts soon. It’s that time of year again. Football is finally back! Today, I will share my predictions for each of the Week 1 games, and I have included a video preview for the Patriots game. In the future, I may include 2-3 other game previews in addition to a Patriots preview. I think the NFL is going to be especially competitive this year, so every win counts, even if it’s against a below average team. Comment with your thoughts and I hope you’re all as excited as I am to watch some regular season football. The Broncos are coming off a really strong draft that helped revamp their offense alongside the signing of QB Case Keenum. I think the Broncos young pair of running backs will flourish against a declining Seahawks defense. I don’t think Case Keenum will ever repeat his spectacular 2017, but I do see him having a strong game and taking advantage of the newfound WR depth in Denver. In the 2017 draft, Denver finally found a third receiver to play alongside Demaryius Thomas and Emmanuel Sanders, Courtland Sutton, and I see him playing a significant role right off the bat. This Broncos defense is also nearly as strong as it was last year. Considering Seattle’s 2017 offensive struggles, I think Denver could easily hold the Seahawks under 20 points. This will allow Denver to blow Seattle out and get revenge on Seattle for routing the Broncos in Super Bowl XLVIII. I think this will be a close call, but I can’t see this stacked Raiders offense losing to the Rams in Oakland. They have a trio of talented receivers, a good mix of long-time veterans and younger guys in the backfield, and a decent QB and tight end group. They also have one of the best offensive lines in the NFL. The Rams are one of my two overrated teams of the year. Sure, they made some exciting moves this off-season, but they lost a lot to free agency in the process. The Raiders defense may not be looking so good after losing DE Khalil Mack, but their secondary isn’t as bad as it seems. I see the secondary keeping QB Jared Goff’s receivers well covered, leaving Goff struggling to find open men. Meanwhile, I don’t see the Raiders offense putting up 30+ points against a relatively strong Rams defense. But I do see them getting by with just enough to pull off the upset in this one. QB Carson Wentz may be out, but backup QB Nick Foles can still lead teams to victory when it matters. I don’t see Foles playing quite at Super Bowl level in this one, but competition motivates him. I think Foles will throw for 2 touchdowns despite being slowed down by the Falcons front seven. Look out for a big game out of WR Mike Wallace as well. With WR Alshon Jeffery injured, coverage will be drawn towards TE Zach Ertz and WR Nelson Agholor, Philly’s next two best pass-catchers. For the Falcons, I think veteran WR Julio Jones and rookie WR Calvin Ridley will have a strong week. But it won’t be enough for a victory with QB Matt Ryan and Atlanta’s RB duo struggling against the Eagles defensive front. It’s sure to be an intense game with two of the NFL’s best quarterbacks facing off. I think both QBs, Tom Brady and Deshaun Watson, will have strong games. But they will be held back by their lack of wide receiver depth, especially Houston, who will be without WR Will Fuller (hamstring). However, this opens up an opportunity for a strong game by WR DeAndre Hopkins. I also see RB Lamar Miller having a strong game with sophomore RB D’Onta Foreman injured. Meanwhile, as the Patriots typically do, expect Tom Brady to find creative ways to score despite the lack of WR depth with Julian Edelman suspended, and that will lead them to a Week 1 victory. The Ravens have one of the stronger defensive fronts in the league, and I can’t see QB Nathan Peterman having a strong game against Baltimore after his regular season struggles in 2017. I don’t see Joe Flacco doing much better, but I think veteran WR Michael Crabtree will find a way to produce against the strong Buffalo secondary, and I think WR John Brown will begin to look like his old self, leading the Ravens in receiving while Crabtree is facing heavier coverage. I don’t think the Bills stellar run game will be enough to outdo the Ravens, but I do think they will force overtime. From there Baltimore will secure the victory with strong defense and a well-crafted winning drive. This will be an interesting game. We have a match-up between two younger quarterbacks looking to take it to the next level. I think both Dolphins QB Ryan Tannehill and Titans QB Marcus Mariota will have promising showings in a close one. Even without WR DeVante Parker, I think the Dolphins wide receivers will step it up in this game to make it close. But I think the Titans receivers are ready to tear apart Miami’s secondary. Expect a big game from veteran TE Delanie Walker, even against S Reshad Jones. You also could see a very strong game out of WR Corey Davis. This is only the beginning of what I think will be Corey Davis’ breakout year. Walker and Davis will lead the Titans past Miami in a close one. I think the Steelers will manage a victory here. But the Browns will make it closer than we’ve seen in a game between these two teams in a long time, with a strong offensive showing. I don’t think QB Tyrod Taylor will look that good against the Steelers D. But I think he’ll manage to find open receivers such as WR Jarvis Landry and TE David Njoku for portions of the game. With RB Le’Veon Bell likely out, expect RB James Conner and RB Stevan Ridley to step it up against the Browns D in Bell’s place. I think the Steelers offense will just be too much for Cleveland’s rebuilding D, especially with a strong game from WR Antonio Brown and a strong debut from rookie WR James Washington. Andrew Luck is finally back. I think he’ll look like his old self, but I see him struggling to find reliable receivers. Besides T.Y. Hilton, Luck doesn’t have many of them. Meanwhile, I think the Bengals offense, led by WR A.J. Green will dominate a Colts defense that isn’t looking great. I think Cincy’s defensive front will look good and shut down the Colts’ young run game. But I don’t think the Bengals secondary will look much better than Indy’s without S George Iloka. That will at least allow T.Y. Hilton to have a strong game and make this a little closer. I don’t think Jaguars QB Blake Bortles will be especially strong against the Giants D, but he’ll find enough open receivers to edge out a victory. Meanwhile, the Jaguars stellar defense will help secure Jacksonville’s lead by holding the Giants under 20 points and 2 touchdowns. However, I see WR Odell Beckham Jr. outplaying Jaguars CB Jalen Ramsey and scoring New York’s only TD in an epic WR-CB match-up. But I think rookie RB Saquon Barkley and the Giants run game will be shut down by the strong Jacksonville front seven. I think QB Jimmy Garoppolo and the 49ers receivers will have a decent game here. But the Vikings defense will limit them significantly, allowing the Vikes to blowout the Niners with Minnesota’s offense outplaying a mediocre 49ers D. I think QB Kirk Cousins will find plenty of open men to throw to in the end zone, and I expect a strong game out of the Vikings RB duo (Dalvin Cook and Latavius Murray) with Cook healthy. I think the one Vikings receiver that will struggle is Adam Thielen, who will likely be matched up against star corner Richard Sherman. But Vikings WR Laquon Treadwell will show promise after a slow start to his NFL career and play a role in Minnesota’s victory. This Buccaneers front seven is extremely underrated, and I don’t see the Saints run game thriving against them with RB Mark Ingram suspended. But with Bucs QB Jameis Winston also suspended, I don’t think Tampa Bay will put up enough points to outdo the Saints in New Orleans. The Saints are the other team I see as overrated, but I still cannot see them losing to a Winston-less Bucs offense at home. I think the Saints defense will play well enough. Offensively, Drew Brees and Michael Thomas will work together to secure the Saints a victory. With QB Patrick Mahomes II starting for the Chiefs, I don’t think the offense will look as good as it did last year. But I do think RB Kareem Hunt, WR Tyreek Hill, and TE Travis Kelce will help Mahomes and the Chiefs keep this game close. However, I see the Chargers offense looking pretty good in this game. WR Mike Williams will look strong at full health, and QB Philip Rivers and RB Melvin Gordon will also put up strong performances, leading the Chargers to victory despite sloppy defense by both teams. The Panthers had a very strong pre-season, and I think they can carry the momentum into the regular season against the Cowboys. I wouldn’t be surprised to see Panthers QB Cam Newton throw 3-4 touchdowns in this one. Cowboys QB Dak Prescott will keep this interesting as I expect him to throw at least 2 touchdowns. However, I think RB Ezekiel Elliott will have a tough time against a really strong Panthers front seven. I don’t think Cardinals QB Sam Bradford will quite look like his old self. But I see him staying healthy and tossing a couple touchdowns in his first start since early last season. I expect QB Alex Smith and RB Adrian Peterson to have strong days as well, making this close. But I think the Cardinals win in the end, led by a dominant day for RB David Johnson in his return, and a strong performance by CB Patrick Peterson in man-to-man coverage against Redskins WR Jamison Crowder. With QB Aaron Rodgers back at full speed, expect a strong game by the Packers offense. I see Rodgers tossing at least 2 touchdowns, and TE Jimmy Graham having an especially strong day. Graham was a great signing, and Rodgers and Graham will make for an amazing QB-TE combo. Rodgers hasn’t had that for a long time. The Bears offense will look strong in this game as well. But I cannot see them putting up as many points as Green Bay does with Rodgers at full health, making the Pack victorious in Rodgers’ return. I expect QB Matthew Stafford to look sharp in prime time against a mediocre Jets D. His receivers should have a strong showing as well, with WR Kenny Golladay showing flashes of dominance, and veteran WR Golden Tate looking better than he was last year. I also think RB Ameer Abdullah will step up his game this season, starting with this prime time match-up. Meanwhile, the Jets offense will look revamped with WR Quincy Enunwa healthy and RB Isaiah Crowell and WR Terrelle Pryor Jr. on board. But I still don’t think it is going to be enough. That’s all for my NFL Week 1 picks and previews. Be sure to comment with your thoughts, and enjoy the first Football Sunday of 2018. This is the 17th time Tom Brady and Peyton Manning will face off, possibly the last. Between the Colts and the Broncos, Manning knows are team too well. He knows Brady, he knows Belichick, so we have to play are game, but run a couple plays that we don’t normally do. The New England Patriots take on the Denver Broncos at Mile High. In November, we went to Denver and they came back to win 30-24, but it was Brock Osweiler under center last time, Manning was out with plantar fasciitis. Tom Brady face off for the 17th time in the AFC Championship but this might be the last if Manning retires. So, who has the advantage in this game? You saw in Week 12, it will be a close game, tough match-up and very physical game. So, lets break it down. Injuries had way more of an impact in Week 12 than now, Edelman was out, DeMarcus Ware was out, Gronk left, Hightower, Collins and Amendola sat too. Now, we have a team at decent health, so does Denver. Denver has a dominant front seven: Sylvester Williams, Malik Jackson, Derek Wolfe, DeMarcus Ware, Von Miller, Brandon Marshall, Danny Trevathan and Shane Ray. That’s EIGHT GUYS, you can only start 7!! Their secondary also includes star corners Aqib Talib and Chris Harris Jr. plus T.J. Ward and Bradley Roby. Steven Jackson, Brandon Bolden and James White better be ready to bull through the defense and find space between the stars, and I trust that they can. I also think that the secondary isn’t strong enough to guard Gronk, Edelman, Amendola, Chandler, LaFell and Keshawn Martin. I think 2 of these 8 will score: Jackson, Bolden, Edelman, LaFell, Amendola, Gronk, Chandler. My original prediction was Gronk and Chandler but now I’m thinking maybe Jackson, Bolden or a receiver will score. Now Denver’s offense. The Broncos even without Peyton Manning would have an overpowered offense. C.J. Anderson usually really shows up this time of year, while Ronnie Hillman continues to do his thing. Plus the receiving game didn’t just use DeMaryius Thomas and Emmanuel Sanders last time. They used Vernon Davis, Owen Daniels, Cody Latimer and Andre Caldwell, who had a TD, too. But the young Patriots secondary will have to try and stop Denver’s pass, they should be able to double cover Thomas, and contain Sanders and Daniels on one man coverage. Vernon Davis, Virgil Green and those sleep receivers, may let loose. They also need to do a better job containing the running game. But in the end, despite facing to more overpowered defense, and being the road team, I think the Pats have the edge with their offense’s match-up and will win by a nose. Even against a ferocious front seven, the Patriots run game needs to keep it up. Tom Brady might not have the protection he needs, and he’ll have to depend on his backfield. They have the individual players to do it, the questions are: Do they work together enough to?, Is the match-up against the defense in their favor? The Broncos run game is revamped too with CJ Anderson at his best. The Patriots have struggled to stop the run all year. This game, they need to excel at it. The young Patriots secondary needs to contain a large number of Broncos receivers that make up its offense’s core. Last time, sleep receiver Andre Caldwell caught the TD that brought the game to overtime, where CJ Anderson had a long run for a touchdown. The Patriots have just as good of receivers when healthy. The Broncos secondary isn’t quite as good as their pass rush, and they might have trouble keeping the receivers from doing much. Between Edelman, LaFell, Amendola, Keshawn Martin, Gronk and Chandler, there’s plenty of guys to cover. CJ Anderson needs to pick up the pace. Between some big games, he’s still been somewhat consistent unlike late last year, even when Manning’s super bowl hopes got crushed in the Divisional Round last year Anderson made an impact. The Broncos need to use their receiving depth to their advantage. Unleash all their sleep receivers and play like the Pats haven’t seen them play yet. It was 3rd and 1. The Broncos were on their first drive in overtime. The Pats had won the toss and tragically gone 3 and out. Then Osweiler handed it to C.J. Anderson. He swerved to the left and just kept going and going. He had just scored the game winning touchdown. The Broncos were the first to beat the once undefeated Patriots this season, with a 30-24 overtime win. It was a very exciting, back and forth game, but it ended with the Broncos putting an end to the regular season portion of the Revenge Tour. If they win a super bowl, then they still get vengeance on Roger Goodell. The Broncos went 3 and out on their first drive. A horrible punt got the Patriots started in Broncos territory. This was turning into a field position game. The Pats marched down the field, and Gronk scored a touchdown. Gronk had already had a nice pass earlier in the drive, lasting 2:07, with 4 plays for a whopping 47 yards!!!! They started at the opposing 47 and easily scored a TD. The great defense continued. The Broncos went 3 and out again, and even the Pats did it after starting around the 50. Still a field position game. On the next drive, the Broncos were on 4th down & inches, and Brock Osweiler ran a QB sneak for the first down. They didn’t challenge the spot, even though it was clearly 4th & 2. On the next set of downs, Osweiler got sacked, knocking Denver out of field goal range. When Brady got the ball back, they sacked him in return. A good punt keeps Denver starting at their own 10. The Pats were thinking safety, but as Osweiler progressed down the field, they had other plans. Sheard knocked the ball from Osweiler, and Chandler Jones caught it in the air for and interception. The Pats marched down the field and Chandler was wide open as Brady threw to him for the touchdown. 14-0 Pats. It was now the 2nd quarter. A couple of drives later, the Broncos progressed down the field, and Ronnie Hillman went beast mode and got a 19 yard TD, making it 14-7. Th next couple minutes before the half were slow, as the Pats failed to score before getting the ball back in the 2nd half. In the first drive after halftime, Gronk caught a 22 yard pass, but it wasn’t enough as the Pats punted it away. The Broncos were near safety territory again on the next drive, but quickly marched down the field to escape. But they didn’t get far away enough. They were in field goal range, but Brandon McManus had to attempt a 47 yarder. It was way off. The field goal was no good, and it was still 14-7 Pats. The remainder of the third quarter was a snooze-a-thon. But things got exciting in the 4th quarter. The Pats went into it with the ball. They had just started a drive before the end of the 3rd. On the first play of the quarter, they threw to Bolden. He had no problem catching it, but the real thriller was what happened next. He took off, and soon the defenders were nowhere to be found. Brandon Bolden kept on running and running, until he got to the end zone. He had just scored a 63 yard touchdown!!!! It was now 21-7 Pats. They had a two TD lead. The Broncos went 3 and out, but on the punt, Chris Harper fumbled in the attempt to return the punt, and the Broncos recovered it. That was his only noticeable play of the night. He ended up with -2 fantasy points. NEGATIVE TWO!!! The Broncos got to start at around the opposing 40. They marched down the field and Anderson scored a touchdown. So technically, CHRIS HARPER is the reason the Pats lost. Otherwise, we would’ve had a 24-17 win. The Pats couldn’t do anything because of some stupid penalties. Denver got the ball around the 50 and they marched down the field. They slowed down in the red zone, and had to settle for a field goal. It was now 21-17 Pats. Our lead was not very secure. On the next drive, we couldn’t do anything because Gronk was called for offensive pass interference!!! It was a stupid call!!! Just stupid!!!! What were those refs doing?!!! Are they just out to get us for “DEFLATE GATE”?!!!! On our next drive, we threw a nice pass to Gronk, but it was followed by a heart-breaker. Brady threw to Gronk for an incomplete pass, but it was worse than that. Gronk had tripped over someone, and fell on his right knee. When the staff came over, to look at it, he was screeching in pain. He was carted off the field, and they are fearing a torn right MCL. On a late 4th quarter drive, DeMaryius Thomas caught a 36 yard pass, followed by an Emmanuel Sanders 39 yarder. Osweiler through the much needed TD pass to Andre Caldwell, giving them a 24-21 lead. Then they can still do it. For now, we’re on to Philadelphia. Last week was shaky, but come on, it’s time for me to get real. I’m basing my picks from here on out on a combination of one, what I’ve seen, and two, as always, the predictions out of my mind and my gut. So, again, lets GET REAL. Now on with my picks. The Redskins defense is no match for Brady’s dominance. This game is kind of a joke. But we are the Patriots. We can’t treat it like that. We have to prepare for it like any other game. Still, this will be a big blowout. Both of the best defenders on the team are questionable. Without Ryan Kerrigan and DeAngelo Hall, the Patriots will put on a show. Blount Force Trauma will still get guarded if Kerrigan plays. But Dion Lewis will have a big game, even if Terrance Knighton, the third biggest component, guards him. This will still be a bigger game for Brady to pass to all his weapons. I could see Danny Amendola having a huge game, with Gronk or Edelman guarded by Hall. In the last three games, Amendola is 16 for 19 with 202 yards and a touchdown. In weeks 1-5, Amendola was 10 for 13 with only 98 yards and a touchdown. On the Redskins side, their rushing game will not be functional against a heavily rush based Patriots defense. But if DeSean Jackson returns, he has potential to be a star. But with Devin McCourty on him some of the time, Jackson may be limited. If he’s out, I’d expect Jamison Crowder’s surprises to continue. Sure, he’s hasn’t yet been effective in the end zone, but he’ll be tempted to score his first NFL touchdown. 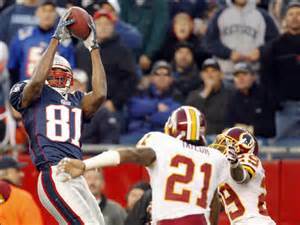 Jordan Reed will get the rest of Devin McCourty or Patrick Chung, so tight ends won’t be functional either. 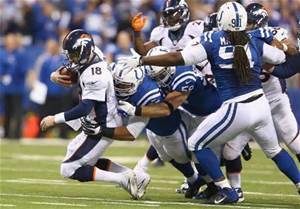 The Colts offense will put on a show to shock Denver, and place them in the loss column. The Colts have more potential in their offense than you might think, even against the almighty Broncos defense. The Colts’ running backs will have full guard. Frank Gore and Ahmad Bradshaw have DeMarcus Ware and Von Miller on them. But the receivers and tight ends are in better hands. Really good players like T.Y. Hilton, Donte Moncrief and Dwayne Allen will have full guard (Aqib Talib, Bradley Roby, Brandon Marshall or T.J. Ward), Guys that haven’t gotten their chance yet this year, like Andre Johnson, Philip Dorsett and Coby Fleener, could have dominant games and lead the Colts offense to a breakout. The Colts defense fits the Broncos offense pretty darn well. C.J. Anderson and Ronnie Hillman have D’ Qwell Jackson and Robert Mathis. DeMaryius Thomas and Emmanuel Sanders have Vontae Davis and Greg Toler. Vernon Davis should also have Darius Butler. That leaves just Cody Latimer and Owen Daniels, oh, and also now third string tight end Virgil Green. Thy still can rack up lots of points, but they will have a little more trouble than Indy getting to the end zone, giving Indy the upset win. This team lost a star this off season, but this player has been disappointing on his new team. This team’s defensive coordinator is the brother of a head coach in the AFC. This team’s division was very weak last year. This team has a quarterback I would consider top 10 all time material. The first two weeks have been full of upsets, and here are some locks, upsets and other scores to watch for in Week 3. 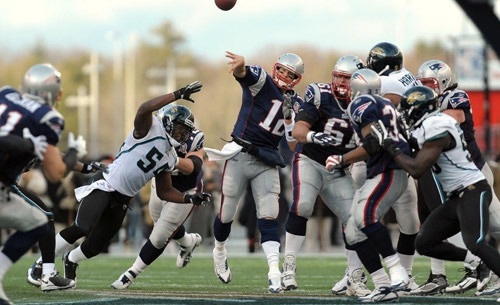 Tom Brady and the Patriots should have a dominant game against the Jags. On offense, they Blount Force Trauma should get more touches after a quiet week 2 return. I’d expect a TD from him. The only road blocks are star linebacker Paul Posluszny and rookie defensive lineman Michael Bennett. He can work around that. I also expect a lot of passing touchdowns. Julian Edelman doesn’t have a starting corner to watch him, so either safety James Sample or safety Jonathan Cyprien is left to guard him. With Edelman and Gronk under that pressure, expect sleepers Danny Amendola, Aaron Dobson and Scott Chandler to show up, about a touchdown each. The Patriots can look forward to a relatively easy match. Tom Brady will stun the Jaguars defense with consistent scoring. On D, they should be all set as well. Running backs TJ Yeldon and Denard Robinson are going nowhere when the defense has Rob Ninkovich, Chandler Jones and Jerod Mayo to cover. Last year they also had the added pressure of Vince Wilfork and Akeem Ayers, but Mayo was hurt. I wouldn’t expect it to be much worse, especially if you put Jamie Collins and Don’t A Hightower in too. And Marcedes Lewis, who has starred to start the year, will be guarded by Devin McCourty. And Allen Robinson will have Malcolm Butler on him. This might sound silly to you, but it’s not really that surprising. Peyton Manning is getting older, and at the same time, Matthew Stafford is on the uprise. Joique Bell and Ameer Abdullah will get touches, but will get DeMarcus Ware and Von Miller as guards. It would be easier to throw the rock. Not just to Megatron, who will have Aqib Talib by his side, but should break through once Talib wears down, but Golden Tate. Tate, the former Seahawk, doesn’t have an amazing second string corner to guard him. Tate should see action, along with tight ends Eric Ebron, thenewly signed Tim Wright and possibly Brandon Pettigrew if he’s healthy. While on the Lions D, it’s a better fit for the Broncos offense. DeMaryius Thomas will have Stephen Tulloch on him like white on snow. Emmanuel Sanders and Owen Daniels may get TDs, but the overall options are limited in Denver. I think Sanders’ season will be a low point in his career, and Daniels isn’t quite a perfect fit in the Denver style offense. Expect an early season loss today out of Denver. What about CJ Anderson and Ronnie Hillman. Ngata and DeAndre Levy should be enough to hold them up. So, the Lions could have a huge win vs Denver today. 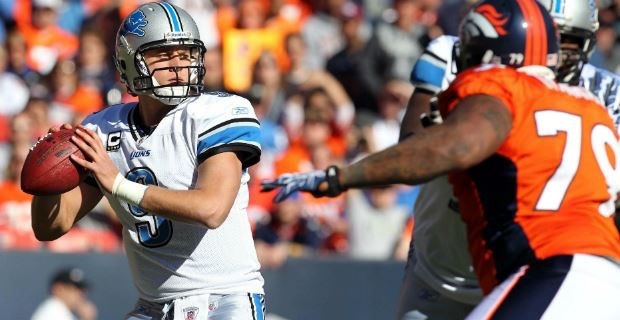 The Broncos defense will be in for a surprise when Matthew Stafford throws fire. 1. This team’s quarterback got severely injured last season. 2. This team has been in last in their division for the last couple years. 3. In 2013, this team’s division was the toughest. 4. This team is named after an animal. 5. This team is located somewhere in the Midwest.